New technologies provide the means to build superb new systems, as well as phenomenally ugly and awkward systems that still fully meet performance and functional requirements. There is a notable lack of adequate theoretical foundations in the area of interface design. Our research is aimed at closing this gap, and is exploring new approaches to a scientific understanding of basic issues of usability, representation, coordination, and value that arise in interface design and related areas, such as how to best display complex scientific information in multimedia; there is also some focus on distributed cooperative work and on formal representation. Techniques include ideas from algebraic semantics, cognitive science and semiotics, for structure, interaction, metaphor, and blending. For more detail, see the Short Summary of Algebraic Semiotics below, the Algebraic Semiotics homepage, publications in the Brief Annotated Bibliography below, and also the UCSD courses CSE 271 (graduate level) and CSE 171 (undergraduate level). Our most recent work places more emphasis on the direct integration of values with the entire design process; see the draft introduction to the book in progress Value-Driven Design, with Algebraic Semiotics, by Joseph Goguen and Fox Harrel; a draft outline of the whole book is also available. Semiotics, Compassion and Value-Driven Design, by Joseph Goguen. Slides for keynote address at conference on Sociology of Informatics, Kyoto University, 13-14 December 2005; discusses semi-formal application of algebraic semiotics to software design, emphasizing the roles of values and compassion. For more information, see also the older but related papers: Semiotics, Compassion and Value-Centered Design, in Proceedings, Organizational Semiotics Workshop, University of Reading, UK, 11 - 12 July 2003; and Groundlessness, Compassion and Ethics in Management and Design, in Managing as Designing, edited by Richard Boland and Fred Callopy, Stanford University Press, 2004, pages 129-136. Griot System Homepage describes the multimedia display/performane engine we are developing, to integrate generative graphics, structured generative text (narrative, poetry, etc. ), music, and so on. The page describes the system architecture, lists performances using the system, and gives links to references providing more details. 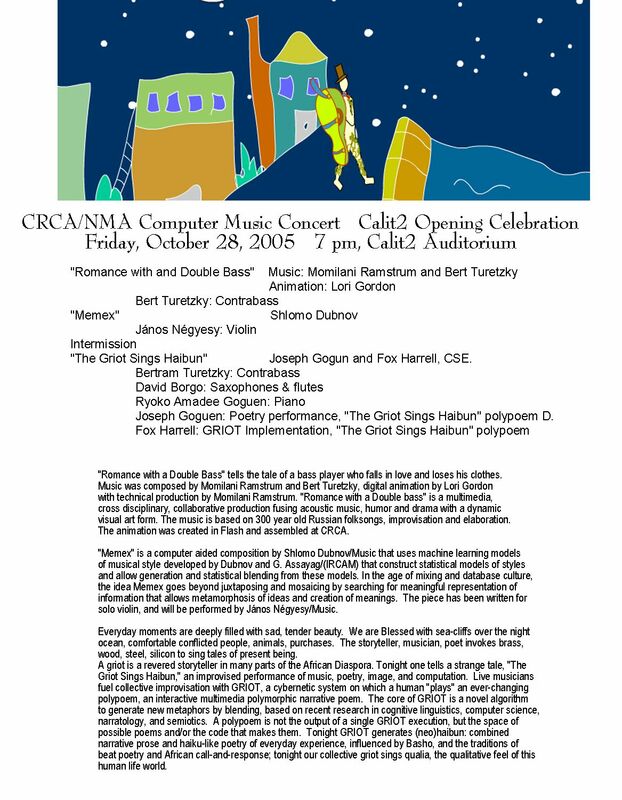 Information about our performance, The Griot Sings Haibun on 28 October, celebrating the opening of the California Institute for Tececommunications and Information Technology building, in cooperation with the UCSD Center for Research in Computing and the Arts. The performers were: Bertram Turetzky, contrabass; David Borgo, saxophones & flutes; Ryoko Amadee Goguen, piano; Joseph Goguen, direction, poetry performance, and polypoem source; D. Fox Harrell, Griot implementation and polypoem execution. Links to Program for the whole concert and Photo of participants in concert (plus some family). Formalization and Implementation for Cognitive Semantics, slides for keynote address at Workshop on the Potential of Cognitive Semantics for Ontologies, Torino Italy, 3 November January 2004. Sorry, it is in MS Powerpoint. Homepage for Computational Narratology, with links for work with Fox Harrell in this exciting new area, which is concerned with developing theory and technology to produce interesting new multimedia narratives on the fly for computer games, active poems, and other new media objects. Style as Choice of Blending Principles, by Joseph Goguen and Fox Harrell. In Style and Meaning in Language, Art, Music and Design, ed. by Shlomo Argamon, Shlomo Dubnov and Julie Jupp; Proceedings of a Symposium at 2004 AAAI Fall Symposium Series, Technical Report FS-04-07, AAAI Press, 2004, pages 49 to 56 (Washington DC, October 21-24). There are also a postscript version, and powerpoint slides for the lecture. This paper proposes a new approach to style based on the principles for blending that works employ; it also includes an implementation approach to syntax based on structural blending and cognitive grammar, and proposes a reconsideration and generalization of optimality principles for blending. A poetry generation system based on this ideas is also explained, and some output is included. Foundations for Active Multimedia Narrative: Semiotic spaces and structural blending, by Joseph Goguen, and Fox Harrell. To appear in Interaction Studies: Social Behaviour and Communication in Biological and Artificial Systems. Algorithms and models for new genres of gaming, entertainment, and art, based on theories of blending, narrative, algebraic semantics and semiotics; also reports experiments with active poetry. There is also a postscript version. Steps towards a Design Theory for Virtual Worlds, by Joseph Goguen. Chapter in Developing Future Interactive Systems, edited by Maribel Sanchez-Segura, published by Idea Group, pages 116-152, 2005; an html version is also available. This paper is an expanded and revised version of a keynote lecture given at the Virtual Worlds and Simulation Conference, Phoenix AZ, 10 January 2001, and published in Proceedings, Conference on Virtual Worlds and Simulation, edited by Christopher Landauer and Kirstie Bellman, Society for Modelling and Simulation, 2001, pages 298-303. It sketches algebraic semiotics and its applications, especially to user interface design and scientific visualization; it is an update of a "distinguished lecture" Algebraic Semiotics and User Interface Design, given at the Institute for Software Research, University of California at Irvine, 20 October 2000. Information Visualization and Semiotic Morphisms, by Joseph Goguen and D. Fox Harrell. An informal introduction to the notion of semiotic morphism from the field of algebraic semiotics, showing how information visualization, in both analysis and design, can benefit from a viewpoint based on structure-preserving morphisms. To appear in Multidisciplinary Approaches to Visual Representations and Interpretations, ed. Grant Malcolm (Elsevier 2004), pages 93-106. This book consists of revised versions of papers from the Second International Conference on Visual Representations and Interpretations, Liverpool UK, 9-12 September 2002. An older html version of the paper is also available. Further background for this paper can be found in the webnote Semiotic Morphisms and the paper On Notation. Web-based Support for Cooperative Software Engineering, by Joseph Goguen and Kai Lin. In Annals of Software Engineering, volume 12, No. 1, pages 167-191, 2001; a special issue on multimedia software engineering, edited by Jeffrey Tsai. This is an overview of the Tatami project, featuring version 4 of the Kumo proof assistant and website generator, and focusing on its design decisions, its use of multimedia web capabilities, and its integration of formal and informal methods for software development in a distributed cooperative environment. The paper is a revised and expanded version of a paper by the same authors which appeared in the Proceedings, International Symposium on Multimedia Software Engineering, edited by Jeffrey Tsai and Po-Jen Chuang, IEEE Press, pages 25-32; the meeting was held in Taipai, Taiwan, December 2000. A gzipped postscript version is also available. Are Agents an Answer or a Question? by Joseph Goguen. An essay on agent technology, analyzing the historical, social and ethical context of agent research, with a critique of agent technology based on the social behavior of real (human) agents. A version with more digressions and more complete references appeared in Proceedings, JSAI-Synsophy International Workshop on Social Intelligence Design, held 21-22 May 2001, Matsue, Japan; also available in a pdf version. An Introduction to Algebraic Semiotics, with Applications to User Interface Design, by Joseph Goguen, in Computation for Metaphor, Analogy and Agents, edited by Chrystopher Nehaniv, Springer Lecture Notes in Artificial Intelligence, volume 1562, 1999, pages 242-291. This is the original paper on the mathematical foundations of algebraic semiotics, with 3/2-categories and 3/2-colimits, which provide a foundation for blending with any optimality principle given as a partial ordering on morphisms; the paper also has many examples, especially from user interface design. A preliminary version appeared in Proceedings, Conf. on Computation for Metaphor, Analogy and Agents (Aizu-Wakamatsu, Japan, 6-10 April 1998) pages 54-79, an earlier version of which is Semiotic Morphisms, Technical Report CS97-553, August 1997. A now obsolete extended abstract appeared in Proceedings, Conference on Intelligent Systems: A Semiotic Perspective, Volume II (National Institute of Standards and Technology, Gaithersberg MD, 20-23 Oct 1996) pages 26-31. Notes on Narrative, by Joseph Goguen. Brief overview of some techniques for the analysis of stories, including summaries of the structural theory of narrative, and techniques for the extraction of value systems from stories. Somewhat edited in May 2001. Towards a Social, Ethical Theory of Information, in Social Science Research, Technical Systems and Cooperative Work, edited by Geoffrey Bowker, Les Gasser, Leigh Star and William Turner (Erlbaum, 1997) pages 27-56. A theory of information based on social interaction; it provides the philosophical foundations of our approach to semiotics. A gzipped postscript version is also available. On Notation, by Joseph Goguen. Some basics of Peircean semiotics with easy applications to computer science and mathematics. Revised version of a paper in TOOLS 10: Technology of Object-Oriented Languages and Systems, edited by Boris Magnusson, Bertrand Meyer and Jean-Francois Perrot (Prentice-Hall, 1993) pages 5-10. Social and Semiotic Analyses for Theorem Prover User Interface Design, by Joseph Goguen, Formal Aspects of Computing, volume 11, pages 272-301, 1999. A systematic justification of the style guidelines for the proof websites generated by the Kumo system, based on algebraic semiotics, narratology, cognitive science, etc. Algebraic Semiotics, ProofWebs and Distributed Cooperative Proving, by Joseph Goguen, Akira Mori and Kai Lin. This is an older description of the tatami ProofWeb data structure and the Kumo proof assistant and website generator, emphasizing how semiotics was used in their design. In Proceedings, User Interfaces for Theorem Provers (Sophia Antipolis, France, 1-2 Sept. 1997), pages 25-34. Semiotics is the study of signs. Our research attempts to make this area more systematic, rigorous, and applicable, as well as to do justice to its social and cognitive foundations. Algebraic semiotics combines aspects of algebraic specification and social semiotics. It has been applied to information visualization, user interface design, the representation of mathematical proofs, multimedia narrative, virtual worlds, and metaphor generation, among other things. The course CSE 271 includes a relatively non-technical exposition of algebraic semiotic and many of its applications. More detailed technical information may be found in Semiotic Morphisms, Representations, and Blending for User Interface Design, Foundations for Active Multimedia Narrative: Semiotic spaces and structural blending, and An Introduction to Algebraic Semiotics, with Applications to User Interface Design. Results of this research were used in building the Kumo theorem proving system, along with ideas from narratology (the systematic study of narrative). A basic concept is that of a semiotic morphism, which provides representations in one sign system (the target) for signs from another (the source). Semiotic morphisms can be partial, i.e., they do not necessarily have to preserve all of the signs or all the structure of the source system. The degree to which semiotic morphisms preserve various features provides a basis for comparing the quality of representations, and leads to an interesting study of trade-offs. Our most recent work places more emphasis on the direct integration of values with the entire design process. Mathematical foundations is provided by the rather recent and very abstract field called "category theory" (it is not related to the area of psychology of the same name), by noting that sign systems together with semiotic morphisms form a category. Some modest additional axioms are satisfied, which leads to the notion of a 3/2-category. An appropriate notion of colimit for such categories has properties that make it suitable for studying the blending of sign systems, as explained in An Introduction to Algebraic Semiotics, with Applications to User Interface Design. See also Semiotic Morphisms, Representations, and Blending for User Interface Design, to see how hidden algebra extends algebraic semiotics to handle interaction. The papers Foundations for Active Multimedia Narrative: Semiotic spaces and structural blending and Information Visualization and Semiotic Morphisms include more intuitive introductions to many issues, and the webnote Semiotic Morphisms may be convenient. Much of our recent research on art and music and on qualia and consciousness is also related, as well as our work on blending and cognitive semantics. CSE 171: User Interface Design: Social and Technical Issues. Undergraduate level introduction to user interface design, algebraic semiotics, and more. CSE 271: User Interface Design: Social and Technical Issues. Graduate level introduction to user interface design, algebraic semiotics, and more. CSE 87C, undergraduate seminar on Computational Narratology. CSE 275: Social Aspects of Technology and Science. Studies the complex relations between society, technology and science. CSE 175: Social and Ethical Issues in Information Technology (formerly CSE 190B). An exploration of how social and technical issues interact in information technology, with an emphasis on ethical issues. The Distributed Cognition and HCI Lab, in the UCSD Cognitive Science Department, led by Professors Jim Hollan and Ed Hutchins. The Visualization Lab at the San Diego Supercomputer Center, led by Mike Bailey and others. Homepage of Mark Ackerman, at the University of Michigan; great stuff on CSCW, electronic media, etc. A collection of proof displays generated by the latest Kumo proof assistant and website generator, version 4. This is part of the Tatami project, a goal of which is to make machine proofs much more readable than is usual; the project has some emphasis on behavioral proofs of distributed concurrent systems.